Direct bookings only, per night. We have a minimum stay of 2 nights. We have a family friendly policy at Gwarllwyn, we do not increase prices during the school holidays and we are happy for families to bring food back to enjoy in the suite. To book please contact us direct on 07794 432263. We have many visitors returning, the above prices are for direct bookings we do not use booking agencies. You can also book on line via our website, your booking will show as pending and we will telephone you to confirm your booking. Payment by cash or cheque on departure please, or by direct internet transfer to our bank account or Barclays Pingit. There are three cash machines in Llandovery, Barclays, NISA store and The Co-Op. We are a small business, only one room, so cancellations can have a big impact on us, especially if we have turned away potential guests in favour of someone who has already booked and who then cancels. We do, however, appreciate that unforeseen circumstances can intervene, and we try to be as sympathetic and helpful as possible in such cases. In the event of a cancellation up to 7 days prior to the scheduled date of arrival no charge will be made. If you cancel your reservation within 7 days of the scheduled date of arrival a cancellation charge equivalent to the first night’s stay per room booked will be charged. Guests failing to arrive without notification, will be responsible to a charge equivalent to the total reservation price. 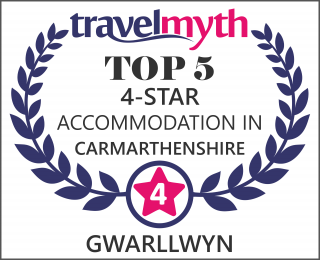 We take all Bookings in good faith, as we are unable to judge reasons for change, cancellation or non-arrival, guests are reminded that no exceptions to the above conditions will be made and that any booking made with Gwarllwyn B&B for accommodation (verbal or written) forms a legally binding contract. For this reason we advise that you take out a suitable insurance product to cover against unexpected costs such as cancellation fees. In addition, we may take legal action, through the Courts, to recover any outstanding debts.